Insulating parka fits snugly to the sides of the keg. Made from a thick wetsuit-type neoprene material, they are easy to take on and off, and reduce condensation buildup. Keeps beer cold for hours, and gel ice packs can be put inside to further increase cooling. Ideal for picnics and parties. 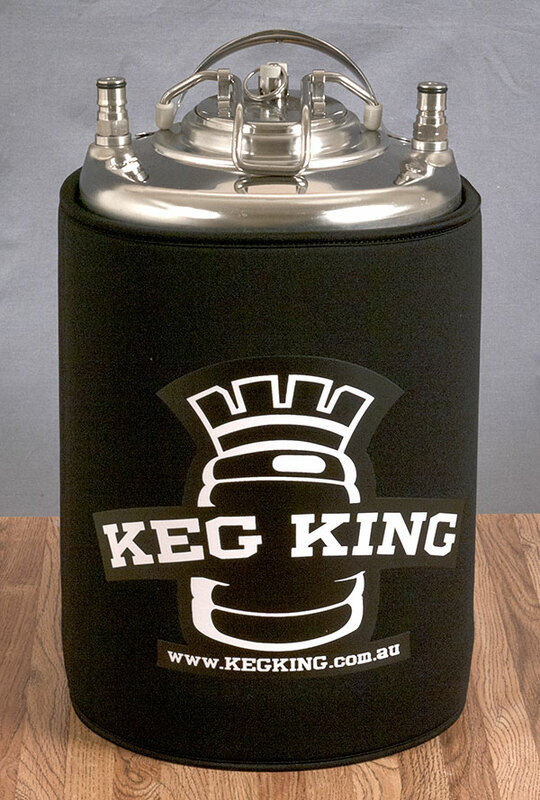 I bought two of these, thinking that they would be great for keeping the keg cool a little longer on a trip, and they do. These keg Jackets are nice and thick, well made and fit the 2.5 rubber tops very well. You can also use a thermometer between the jacket and keg and get a pretty accurate beer temp. Can't add to much else, just confirming what the other reviews said, they are a great product. from Sugar Land, TX Great "Keg Kozy"
Do not be alarmed when you see the packaging and the first number is "2.5." There is the second part, " to 3 gallon," relevant to my own case. It fits the 3 gallon keg like a comfortable glove, and I am very glad to have a couple of them for transporting my two fun-sized party kegs to parties. While so far it has only kept my keg cold in the already-cold fridge, I am glad to have them on hand for future use. These little babies will be great to retain some cold inside the keg and pad the basic keg in transport mode. Finally, as I write this review today, I am enjoying my first draw from the kozy covered 3 gallon keg, pulling a nice Black IPA into a Williams nucleated beer-can sized/shaped glass, and reading the Williams Brewing Summer 2016 catalog that just arrived in the mail. A perfect Saturday in 'Burbia, Houston. Remain calm and chill on! bought the 2.5 and its works great to take to brewers guild meetings keeping it cool. its nice and thick i thought it would be just koozie thickness. from Nevada If you own a keg you NEED this! I bought 4 of these (2 for 5gallon kegs & 2 for my 3 gallon kegs) last week for a charity home brew competition this past weekend. First off, Williams Brewing's service is fantastic! I ordered it in the early afternoon and it arrived the next day. Thank you Williams Brewing! Now to Keg King Keg Parkas. They go on very easy, work great and at half the price of some other brands they are an excellent value. I have been a SCUBA diver for over 35 years and have had some high-end custom made wetsuits that did not have as good a quality of stitching and finishing. I put them on my kegs when I took them out of my fridge at about 8AM and set up about 9:30AM. No ice was available until around 11AM. My beer stayed nice and cold. Once ice was available, I rolled the bottom of the parka up and put the kegs in 5 gallon buckets of ice and water. The top of the keg never got noticeably warm. If you have kegs and ever take your beer to a party or competition, you need these! Would this work for a 1.75 gal keg? Can it be cut to a shorter height? It will fit, but you will have to cut the rubber neoprene material down to size, and the cut might be a little ragged. Do you sell the ice packs for this set up? Cost? No, but this is a good idea! You can buy flexible ice packs that resemble bubble wrap online that work fine.